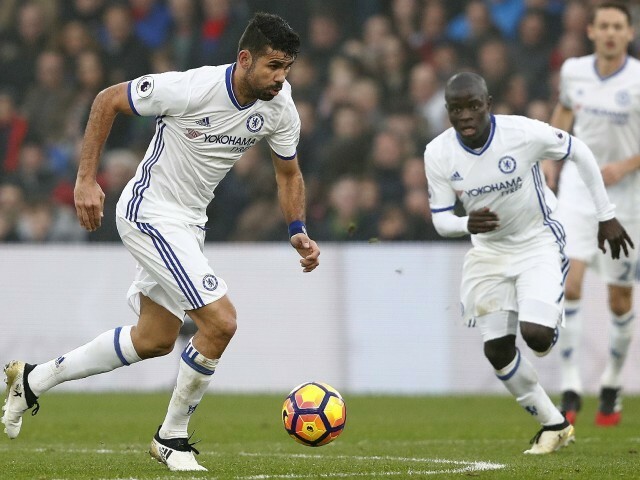 Costa headed home Cesar Azpilicueta’s cross in the 43rd minute at a foggy Selhurst Park to send Antonio Conte’s men nine points clear. Meanwhile, Zlatan Ibrahimovic scored twice as Manchester United won 2-0 at West Bromwich Albion, while champions Leicester City weathered the dismissal of Jamie Vardy to come from 2-0 down and draw 2-2 at Stoke City. Narrowly beaten 2-1 by Manchester United in mid-week, Palace threatened to take the lead against Chelsea when Jason Puncheon scuffed wide from Martin Kelly’s cross. Marcos Alonso struck the bar with a late free-kick, but Costa’s goal proved sufficient. Jose Mourinho’s United drew level on points with fifth-place Tottenham Hotspur, who host Burnley on Sunday, after winning at West Brom to record three successive league wins for the first time since August. Ibrahimovic opened the scoring in the fifth minute with a header from Jesse Lingard’s fine right-wing cross at the conclusion of a magnificent team move. The former Paris Saint-Germain striker darted between two defenders before scoring via a deflection off Craig Dawson, leaving him with nine goals from his last 10 appearances and 16 for the season. Leicester avoided a ninth defeat of the campaign thanks to an impressive fightback in a stormy game at Stoke, which left Claudio Ranieri’s men three points above the relegation zone in 15th place. Vardy was shown a straight red card in the 28th minute for a two-footed challenge on Mame Biram Diouf, ruling the England striker out of Leicester’s entire festive programme. But Leonardo Ulloa halved the deficit, smuggling a header over the line from fellow substitute Demarai Gray’s cross, before Christian Fuchs teed up Daniel Amartey to head in an 88th-minute leveller. Discussing whether Vardy deserved to be sent off, Leicester manager Ranieri said: “One manager says yes, one says no. If you listen to me, I say ‘no’. If you listen to Mark Hughes, he says ‘yes’. Swansea dropped to second-bottom, with Sunderland climbing off the foot of the table after Patrick van Aanholt’s 49th-minute goal secured a 1-0 home win over Watford. Hull City are now bottom following a 1-0 defeat at West Ham United, who prevailed through Mark Noble’s 76th-minute penalty after the visitors had hit the post three times.